Concordia Lutheran High School is hosting summer camps for all ages this summer. 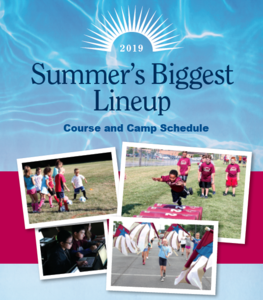 Camps range from athletics to band to robotics and everything in between including new camps in art, Spanish, track and sign language. Concordia is also offering summer classes for all area students in grades 8-12. Registration is now open, and online registration is now available this year. For more information and to register, visit www.clhscadets.com/summer. FORT WAYNE, Ind. — Concordia Lutheran High School is hosting summer camps for all ages this summer. Camps range from athletics to band to robotics and everything in between including new camps in art, Spanish, track and sign language. Concordia is also offering summer classes for all area students in grades 8-12. Registration is now open, and online registration is now available this year. For more information and to register, visit www.clhscadets.com/summer. Concordia also offers two sessions of summer classes for students in grades 8-12 during the 2018-19 school year. To learn more and to register, visit www.clhscadets.com/summer. Concordia Lutheran High School, located at 1601 St. Joe River Drive in Fort Wayne, Ind., was founded in 1935 as a private, co-educational Lutheran high school open to students of all faiths and backgrounds. With Christ at the center, Concordia continues to pursue educational excellence that equips individuals for lifelong learning and service as disciples of Jesus Christ. Learn more at www.clhscadets.com.